Over 2,220,474 Parts in Stock! Free technical assistance available - 01246 250678. This product is covered by our 90 day guarantee. Register Here, 20% discount and 0% restocking fees. When purchasing a repair service you will need to send your item to us at the address here, including your order number. If your item cannot be repaired we will return the item to you and the repair charge will be refunded. We will endeavour to find a replacement part for you if the item cannot be repaired. Please Read Before Making A Purchase. Below is a full explanation on how to find Panasonic part numbers. We Offer up to 20% discount and 0% restocking fees for trade customers please contact us for further details on how to get this discount. EMOS TV's have over 20 Years experience in the Tv trade working on all types of equipment old and new. We aim to offer the best service possible to people in the trade or who are competent enough to repair their own products. If you need advice on your faulty product please feel free to ask, we will be more than happy to advise you. Parts all carry a 28 day return to us guarantee, we will do all we can to help if the part does not cure your fault. Please do not purchase any parts if you are unsure it will cure your fault, Please message our technical help team via eBay using the "Ask a question" link below, One of our advisor's will be happy to help. We have over 65,000 parts available. Can't find the part you're looking for? Ask us a question regarding it and we'll do what we can to help you find it! Panasonic Error Codes; If you're noticing your standby light flashing a set amount of times, this is giving you an error code by the number of flashes. If your set is giving out an errorcode to you and you're unsure as to what it means, please contact us. 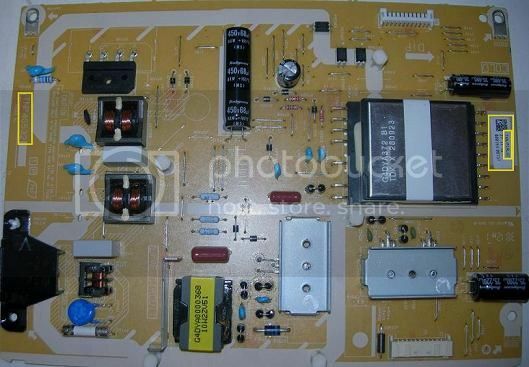 Panasonic Main Boards; Finding a Panasonic main board P/N isn't so difficult once you know what you're looking for. The numbers that you are looking for is first a; 'TNP' number which is just the blank board number on the Panasonic AV boards, this number should only needed to be used if you can't locate the 'TXN..' number on the board, being the actual Panasonic P/N if you find this number then you must ensure that the board you go onto purchase has the matching 'TXN..' number within the listing, type the P/N into our search bar to instantly check if we have the board available for you or not. Panasonic Power Supplies: With Panasonic Power Supplies in Panasonic set there is a wide variety of possible PCB's each type having a different part number. TXN - One of the types of possible PSU's it could be a 'TXN' board, if you can spot a TXN number upon your board (95% of the time located in a white sticker label) then that's the number you're after, if you happen to see a 'TNP' number before the 'TXN' then this is the blank board number for the 'TXN' board, so then you know it is a 'TXN' number you're after. 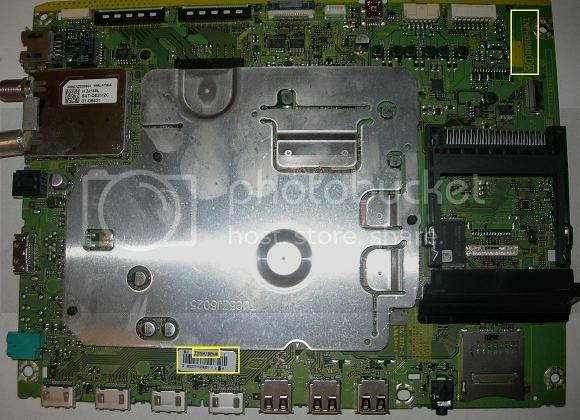 Panasonic Ysus/ Xsus: Both the Ysus and Xsus board are the same in terms of finding the part number for either of the one you're after. So search the board for a 'TXN' number, it'll more than likely be in a white stick label on the board and locate on the top line of it. Quite often there is no 'TXN' part number on the Panasonic Ysus and Xsus boards and if this proves the case it is important to find your blank board number; 'TNPA..'/ 'TNPH..' and ensure that the board you're looking at when buying is out of the exact same size set as the TV you're attempting to fit. So if you match a TNPA number with one on our site and you're after a board for a 42", however there is no 'TXN' number on the board it'll not work if you go on to buy a board with the matching 'TNPA..'/'TNPH..' number out of a 50". 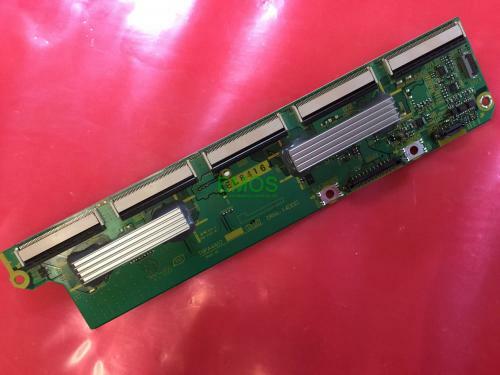 Panasonic Buffer Board: When finding the relevant part number to match up with a replacement board for your set the number you should be looking for is a 'TXN..' P/N on a white sticker label on the board. On the odd occasion there will not be a 'TXN' number located on the board this is when the 'TNP..' number becomes relevant and matching the size of the model listed to the size of your TV, for example if you're after a buffer for a your 46" make sure the buffer with the matching 'TNP..' number is out of a 46" too. If we're out of stock our skilled engineers can repair most boards so please get in touch and see if we're able to repair your board!